It's one of the more ominous sights in pro sports: three referees, huddled around the scorer's table for agonizing minutes, reviewing a crucial late-game on a tiny monitor. According to a report from the Sun-Sentinel's Ira Winderman, after next month, it'll never happen again. 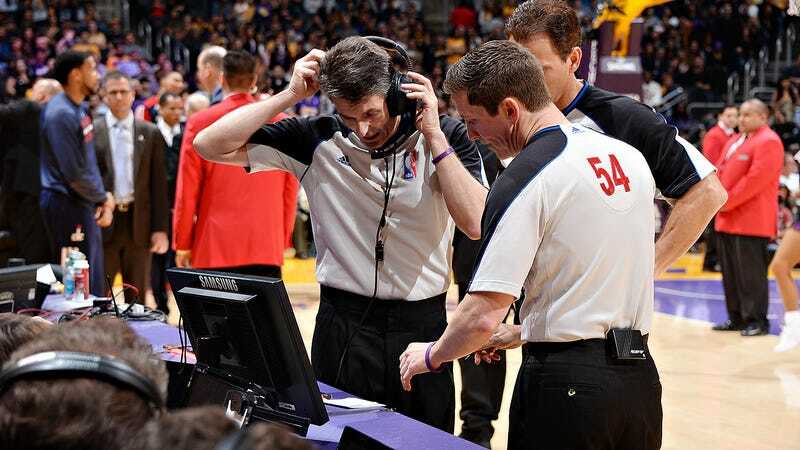 According to Winderman, the NBA has finalized plans for a centralized replay system, with all reviews as of next season being conducted from a single location, presumably by officials at the association's New York office. That would bring the NBA in line with the systems currently in use by the NHL and MLB, and realize one of Adam Silver's stated initiatives in his first year as commissioner. "An off-site review would potentially speed up the process," Silver said during last year's finals, and at this past all-star break, again hammered home the idea that centralized replay is largely about making reviews faster. "Now, as you know, the game stops, the referees walk courtside, turn the monitor around, talk to the truck, order up the replays. And I think that it's our belief if we can get it right, that if have you officials, in essence, located at headquarters, at a central site, that that process can begin immediately, they then can communicate with the officials and that will save time." Sure, fine. But more important than that, standardized, off-site reviews are a lot more likely to be correct. In 2014 (or ever, really,) there's no reason why you at home should have a better view of a replay than the officials actually in charge of reviewing it. Bigger screens, better replay feeds, no arena full of crowd noise—all things helpful for getting the best look at a play. On top of that, a central command center doesn't have to worry about making a crowd angry or dealing with the ire of teams when making a controversial call that goes against them. It's immensely helpful for a ref to be able to tell an aggrieved coach or player, "it wasn't my call." "My sense is where we'll probably end up is giving the officials some more discretion of what they can look at when they're over there," said Rod Thorn, the N.B.A. 's president for basketball operations, repeating remarks Commissioner Adam Silver made last month. "Everybody can see something that looks like a foul but the official, because he was restricted from applying his judgment."